It was everything I had hoped it would be, though the weather let us down. We left Devon with blazing sun and the further north we travelled the grayer it became. But no matter - it looks much brighter in the photographs than it actually was. We travelled up after school for the weekend to the Trent & Mersey Canal which is north east of Birmingham; to a village called Alrewas, where we met my mother and Robin who had moored there over night. 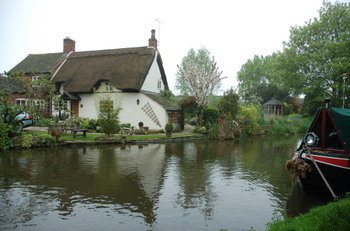 Even though it was dark I could see that it was absolutely beautiful with thatched cottages, swans and ducks (complete with tiny ducklings which the girls loved) and I thought I had died and gone to heaven! 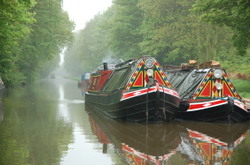 We spent the night rather cramped on the boat (it was a 6 berth narrowboat and there was 7 of us but they are very well designed and we were very comfortable!) and were up early to be first in the queue for the locks. It was the children's first experience of canals and locks so they needed a lesson by Granny. Lucy spent a long time steering the narrowboat under the watchful (and loving - just look at the way he is looking at her..sniff!) eye of Poppa. Though she was most put out at the comment of another 'sailor' who teased her and called her 'a woman driver!' "It's the first of many Lucy!" was the only sympathy she got from me! 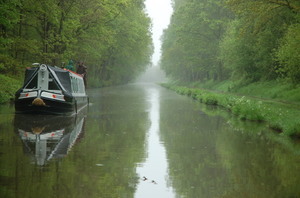 ..the photo was taken from the narrowboat and it stirs up a multitude of feelings in me. 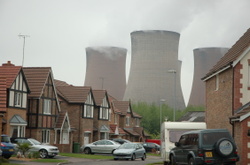 I am completely drawn to the chimneys - their ugliness is quite compelling. The smoke that is belching out makes me want to hold my breath. We went on a bit further and we were able to look into peoples gardens as the canal cuts through the towns. And then on to one of my favourite pictures..
..these new (expensive?) neat and tidy houses completely dwarfed by those alien chimneys! It fascinates me but also makes me very grateful that we live in a nicer part of the country. I must find out what they are. They look so enormous don't they? Life has gone on around them with new housing estates being built in their shadow..
We stopped in Rugeley and I even got to 'do' some charity shops and found a flowery oval plate! The next day we had to go home with heavy hearts but feeling better for the slow pace of life. More photos here. Thank you Mum and Rob for putting up with us -- it was just what we needed!